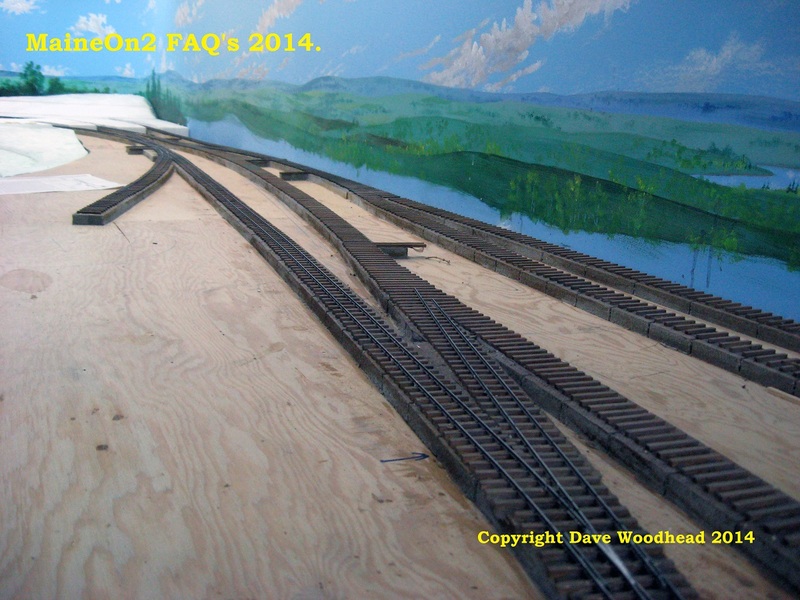 Editors note, 26-03-2015: Original P:48 Layout plan added, and scenery attributed to Rick Reimer. 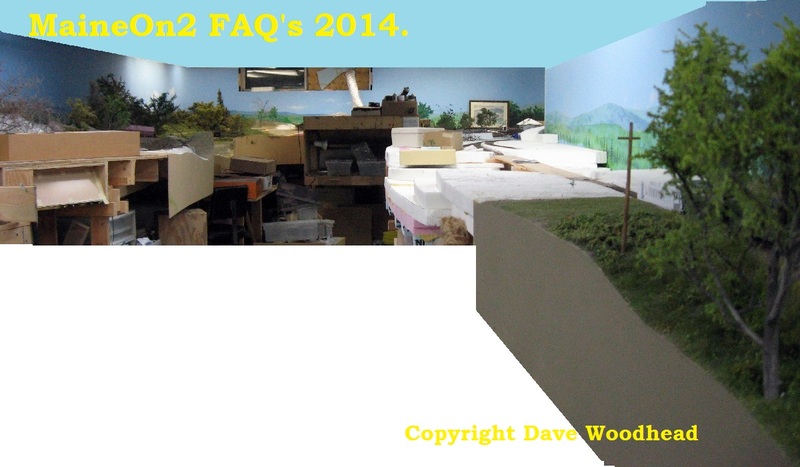 Editors note, 09-06-2014: in the last couple of months we have received two further collections of pictures of Bill’s layout, as well as seeing a copy of the layout plan. These have allowed us to expand the original post, as well as putting the pictures in the correct sequence and showing the correct attributions. Many Thanks to Dave Woodhead, Gary Graham and Stuart Edmondson for their contributions. 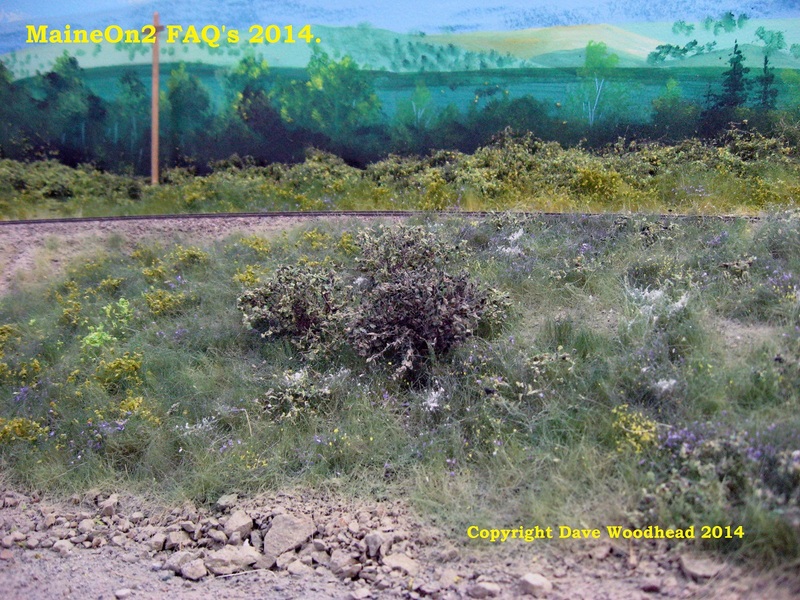 Heading Picture: This area is typical of Rick Reimer’s scenery on Bill’s layout, click on it to get a larger copy and take some time to look at the various features like wild flowers etc. In layout terms this is heading North from the Covered Bridge area and into the Avon Roadway and Swamp areas on the way to Rangeley. Bill’s layout was located in the basement of his Calgary home, occupying a 640 square foot area at one end. 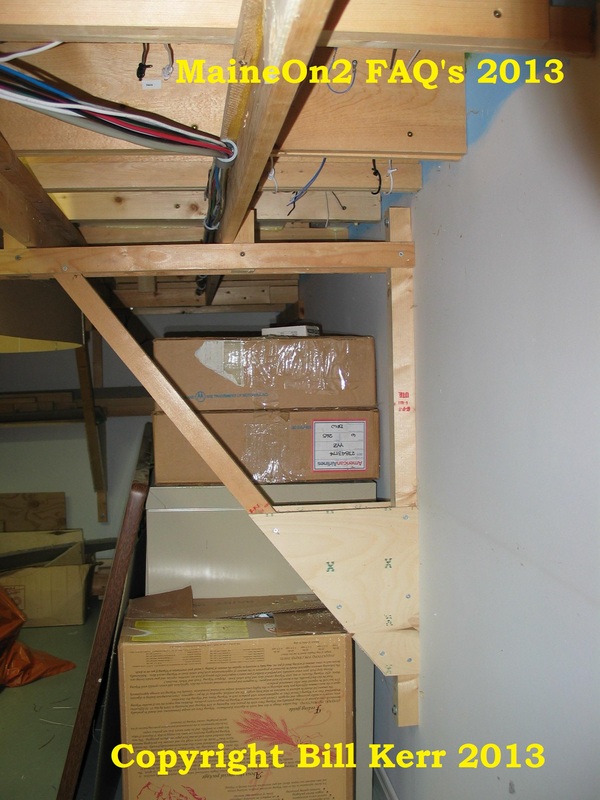 The space was nearly 40 feet long and the width varied in three steps from 18 feet down to 11 feet 8 inches. The layout was started as a Proto-48, standard gauge layout based on Canadian National Railway recollections from Bill’s youth. A plan of this original proposed layout is shown at the end of this posting. 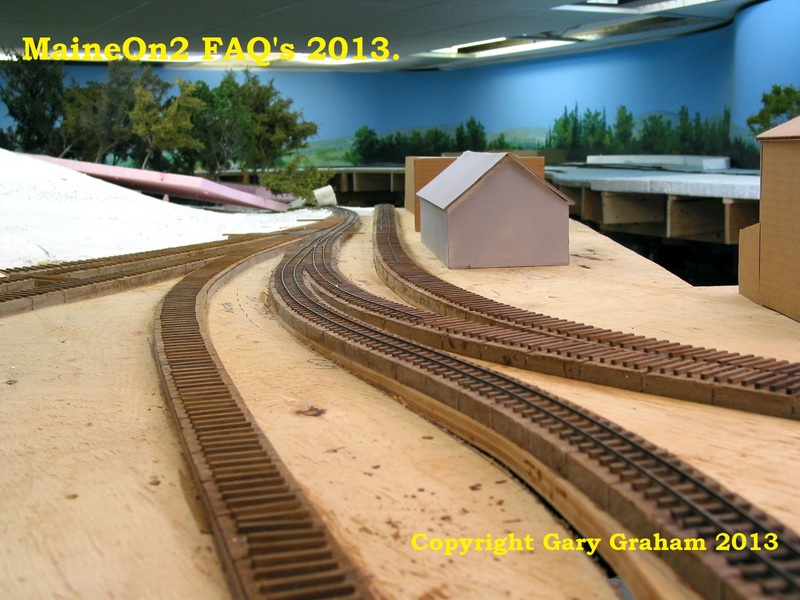 Sometime after the first sections of hand-laid track were completed, Bill decided he liked the idea of a Maine 2-foot gauge layout instead, and Rick Reimer reworked the P:48 layout design into the On2 version shown here. Bill was a big fan of the SR&RL, and the layout was changed to follow that line northwards from Strong to Phillips and then onto Rangeley and Marbles. A non-prototypical bridge connected Marbles to Strong for a continuous running lap of 105 feet for open houses. When operated in the end to end mode, the run from Strong to Marbles was 95 feet. 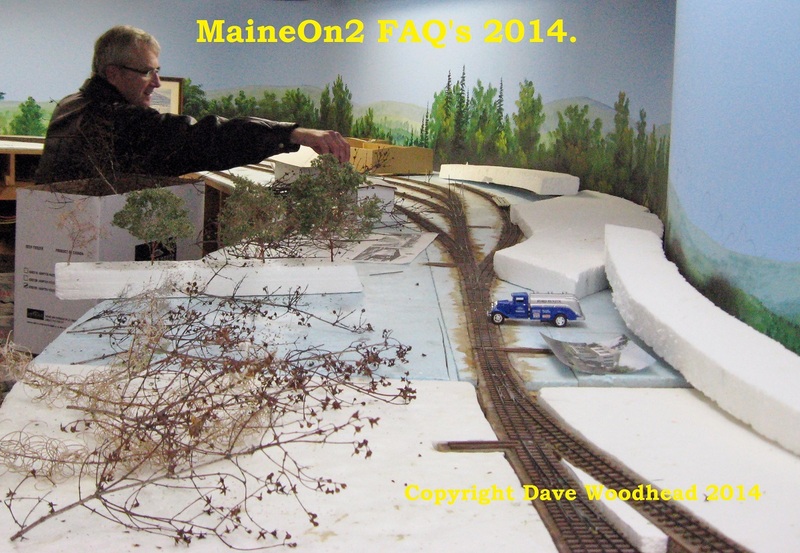 Bill’s Maine Two Foot modelling “must haves” were to build the Phillips Roundhouse, the Covered Bridge and the Salmon Hole Bridge in full scale/size, and his “wants” included Marbles Station and the Dickey Road Underpass. 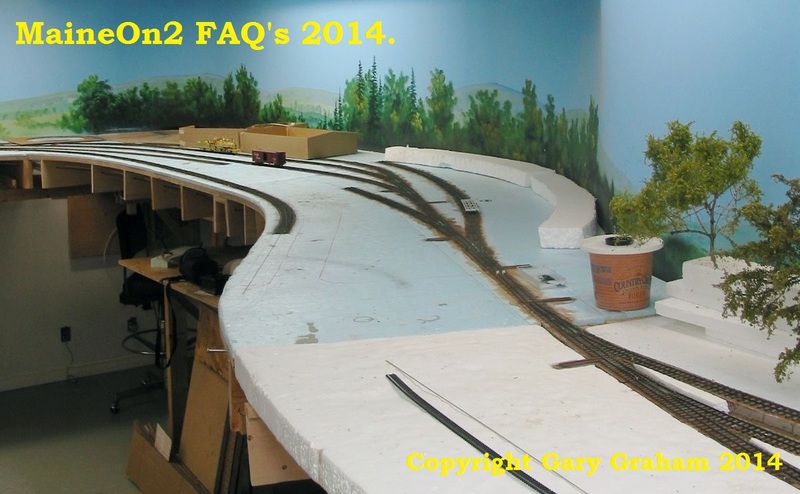 Bill’s friend and scenery guru, Rick Reimer designed the On2 SR&RL layout and managed to fit all this in the available space. The layout featured a 60” minimum curve radius and used #8 turnouts. 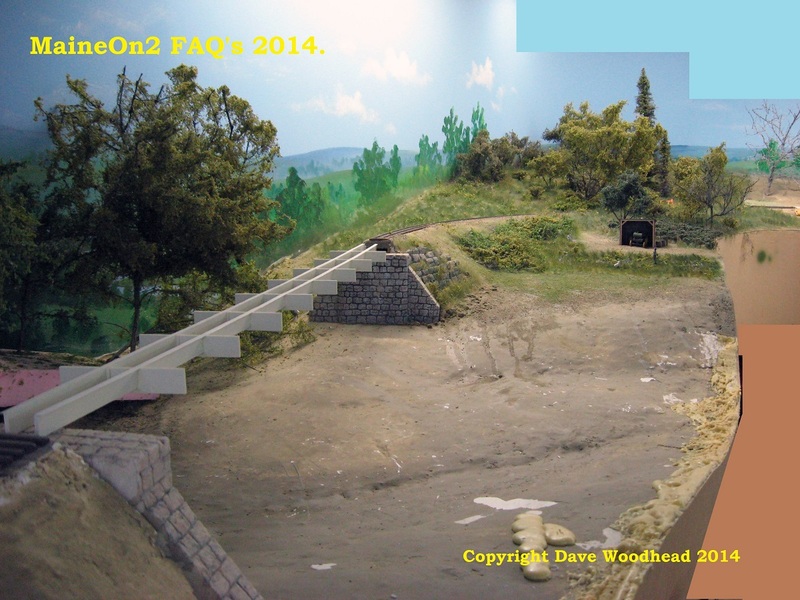 Bill is on record as stating that his focus for this layout was more on scenery than operation, meaning that he chose to use the space available for realistic settings and full scale structures rather than cram in unrealistic amounts of track work. 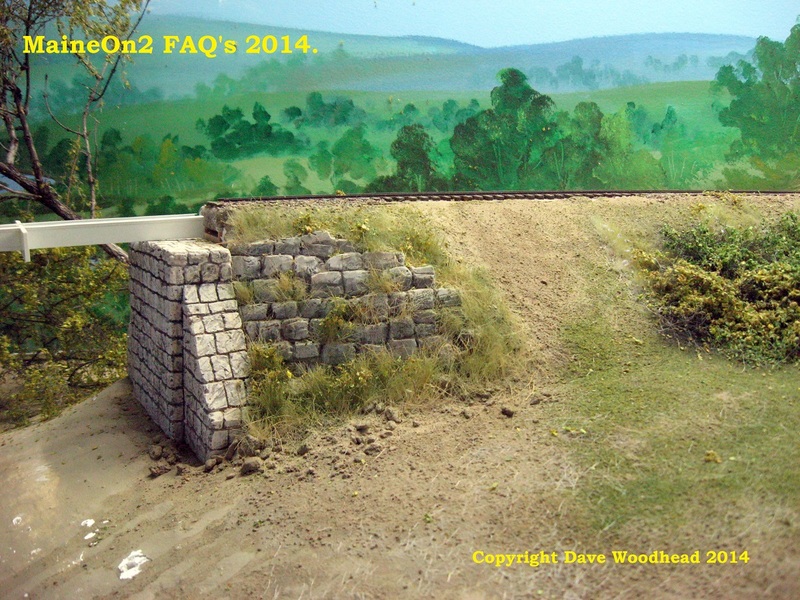 Most of the scenery shown in the following pictures was done by Rick Reimer with some assistance from Bill Kerr. Construction of the On2 layout started in 1998. 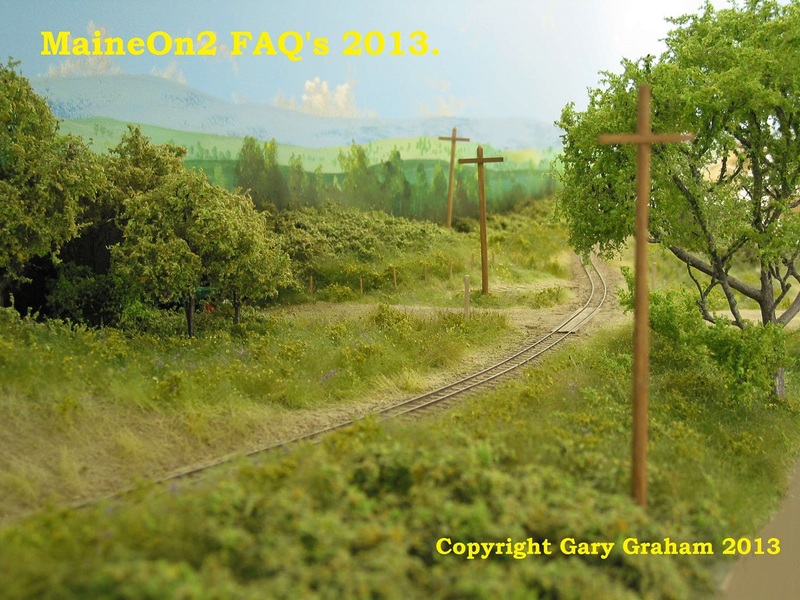 The pictures attributed to Bill and Gary Graham with the MaineOn2 FAQ’s 2013 header are believed to have been taken between 2002 and 2006 and were originally posted on the groups Fotopic site and the first version of this blog write-up. Bill’s original captions from Fotopic are shown;- Bill said/wrote “….”. David Woodhead is a professional musician and modeller based in Toronto just a few blocks away from Trevor Marshall. Dave is on the road a lot and often manages to combine these trips with railfanning. On one occasion, back in 2007, he visited Bill at home in Calgary and has provided a set of pictures recording the visit. Thanks Dave! Note that Bill’s and Gary’s pictures were essentially staged pictures to show selected areas of the basic layout and scenery techniques or to record events at group work nights, whereas Dave’s more impromptu pictures record the layout (and layout room) at a later date with all the usual extra’s that seem to accumulate on and under most layouts. 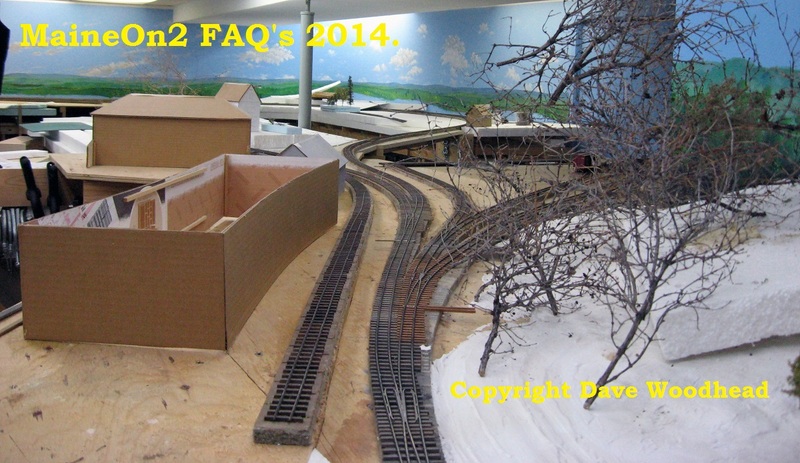 Dave’s pictures are useful because they show much more of the layout, including area’s under construction. The pictures are arranged in sequence to follow the route of the line northwards from Strong to Phillips and then onto Rangeley and Marbles. This is basically around the walls in a clockwise direction from the entrance in model layout terms. Picture 1: This is the view that would greet a visitor as they entered the layout area, looking at Strong in a Northerly direction. Picture 2 : Bill wrote “Track to left connects to Marbles for continuous running during open houses.” Picture 3 : Bill wrote “Strong throat at the Forster toothpick sorting building. Yes, we built the layout strong. That’s Gary Graham changing a switch for the third time.” Picture 4 : Strong looking North to Phillips with the mock up of the Forster Mill disappearing off to the right. Bill wrote “Gives you an idea of the terrain planned.” Picture 5 : Looking back (southwards) at Strong and the Forster Mill. Picture 6 : Looking back (southwards) towards the Dickey Road Underpass from Salmon Hole. The weird dark shape in the background is a set of coveralls hanging from the ceiling. Picture 7: Looking Northwards across an unfinished Salmon Hole. Picture 8 : Close up of one of the Salmon Hole abutments. Look at those weeds!. Picture 9 : Heading North from Salmon Hole the line runs around a small farm field called Potato Patch with a storage shed for some old farm equipment. Gary Graham built the tractor and the shed. Picture 10 : Bill wrote “This is Potato Patch, source of some potatoes for the cannery. If you look close, there are potatoes at the feet of the farmer. (good use for HO ballast ;^)” That’s a 60 inch radius curve in the background. Picture 11 : Bill wrote “This is Potato Corner where the track rounds the Potato Patch.” Note the 60 inch radius curve in the background. Picture 12 : Cardboard templates and mock ups show the position and extent of the buildings at Phillips. Bill wrote “The Car Works #23 gives you an idea of the size of the planned roundhouse facilities.” Picture 13 : A view southwards looking along the extent of Phillips. Picture 14: Another view of Phillips showing Bill’s characteristic cardboard mock-ups of the passenger station and the freight house. Picture 15 : Still heading North and looking back into Phillips, with Bill Kerr in the background. Bill’s other interests included hiking and distance running. Both activities doubled as potential scenery items scouting trips. 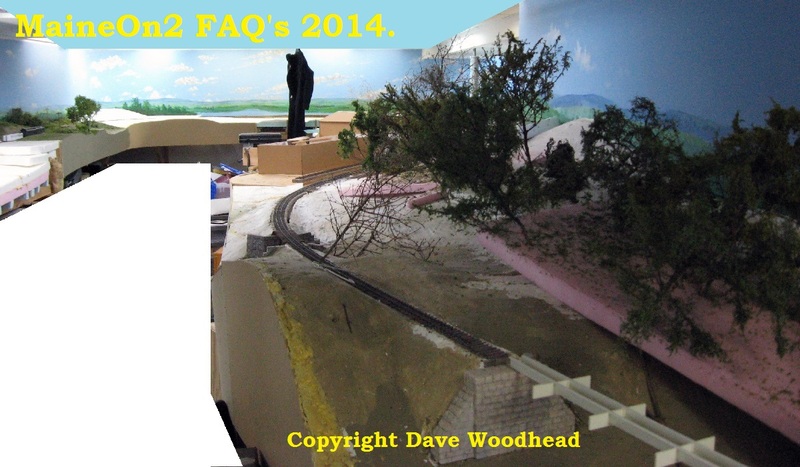 You can see some foraged plant tops drying on top of the layout, and some finished trees stuck in the scrap piece of foam behind. Picture 16 : heading North from Phillips and looking back across the Covered Bridge area, with landscape still under formation. 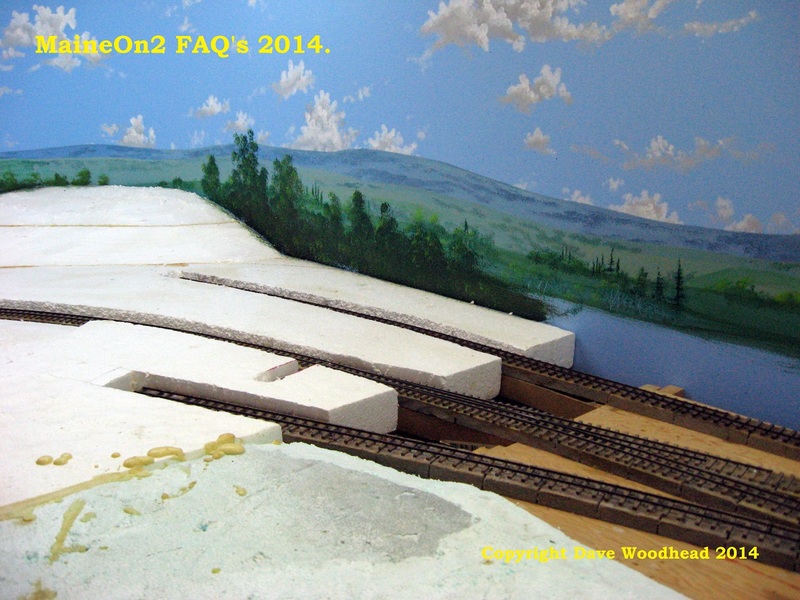 This view shows Bill’s methods of stacking of expanded polystyrene sheets and gluing with 2 part urethane expanding foam to form the scenery contours particularly well. Bill obtained the expanding foam in small quantities locally from a local taxidermist who bought in bulk, and noted that the mixed material was extremely sticky and seemed to get everywhere. It was difficult (impossible) to remove from clothing – hence the old coverall in some pictures. Picture 17 : Heading North from the Covered Bridge area and taking a long look back from the Avon Roadway area, with Phillips in the right hand corner and Strong across on the middle left. Picture 18 : A better view of that tree, and remember it pre-dates the Gordon Gravett books on trees! Picture 19 : Bill wrote “Now that is what I call a nice good looking tree to the right! Leaf and added branch structure from Selkirk Scenery, added to natural branch cut from a tree along the Bow River in Calgary.” Picture 20 : Bill wrote “I always liked the scene in Avon of the Rail Auto #2 (2nd) pulled off to a small temporary siding, the Vose car stopped talking to the B&B crew cutting the grass. The truck in the background is S scale which creates a nice forced perspective.” Weeds and flowers are made using Selkirk Scenery materials. Picture 21 : showing a view across the Avon Swamp, with the Vose road car parked by the side of the Avon Roadway having just watched (inspected) a passenger train heading southwards to Phillips. Picture 22 : Close up view of the weeds on the edge of Avon Swamp made with Selkirk Scenery materials. Picture 23 : Around the corner into Rangeley with partially formed landscape. Picture 24 : A view of the Rangeley area under construction. 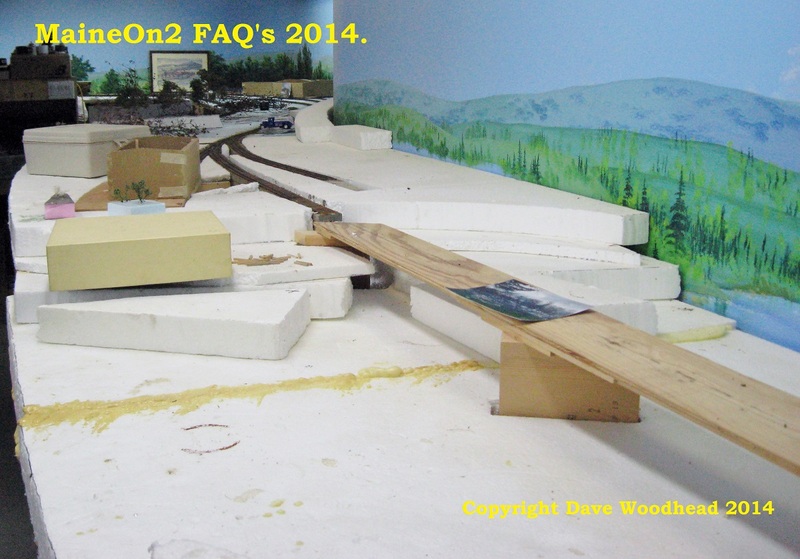 This picture shows the stages from basic plywood table top, homasote roadbed, individual ties and then rail quite well. Picture 25 : A view of the Marbles area. This view shows the style of cardboard mock up that Bill used to quickly show the size and style of a structure. Photocopied drawings stuck to the sides greatly enhances the mock-up. Picture 26 : An under baseboard view showing how the bench work was supported from the wall and details of the framework supporting the plywood table top and the very neat wiring. and finally How it started;- The layout was started as a Proto-48, standard gauge layout based on Canadian National Railway recollections from Bill’s youth. Rick Reimer drew up the track plan shown below and construction started. 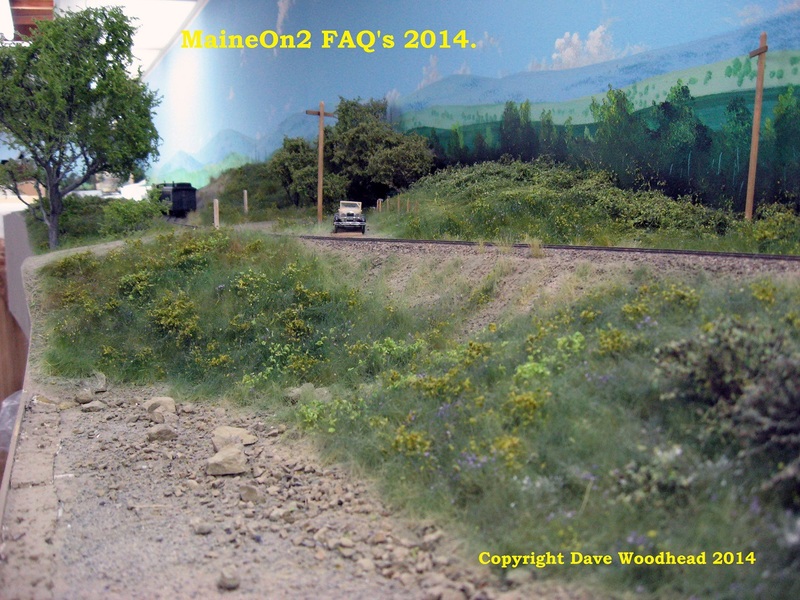 Sometime after the first sections of hand-laid track were completed, Bill decided he liked the idea of a Maine 2-foot gauge layout better, and Rick Reimer reworked the P:48 layout design into the On2 version in the body of this posting. 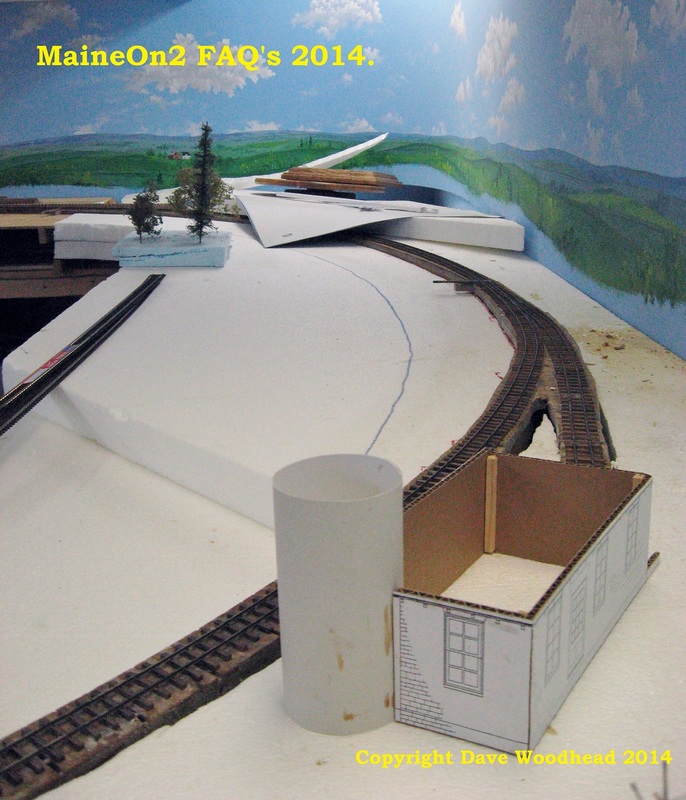 Tailpiece: Bill Kerr passed away in July 2013, and the layout was dismantled later in the Fall. 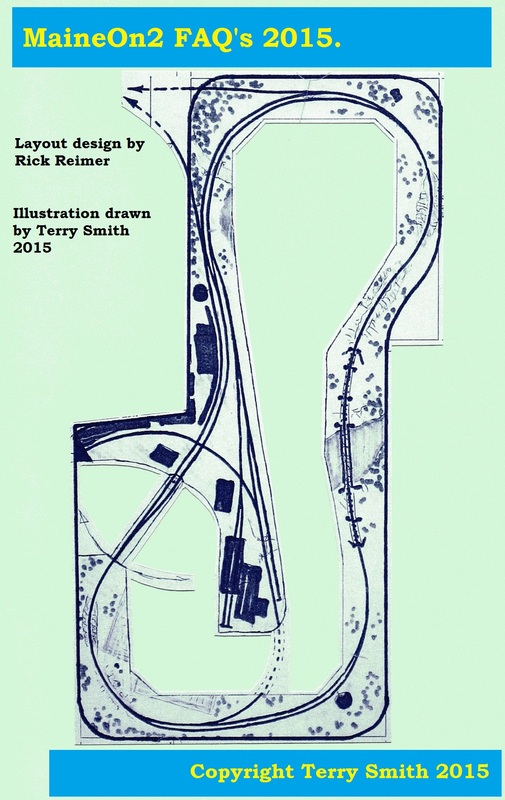 This entry was posted in Bill Kerr, Layouts, Sandy River and Rangeley Lakes by terry2foot. Bookmark the permalink. I believe Photo 12 is Phillips, not Strong as captioned. 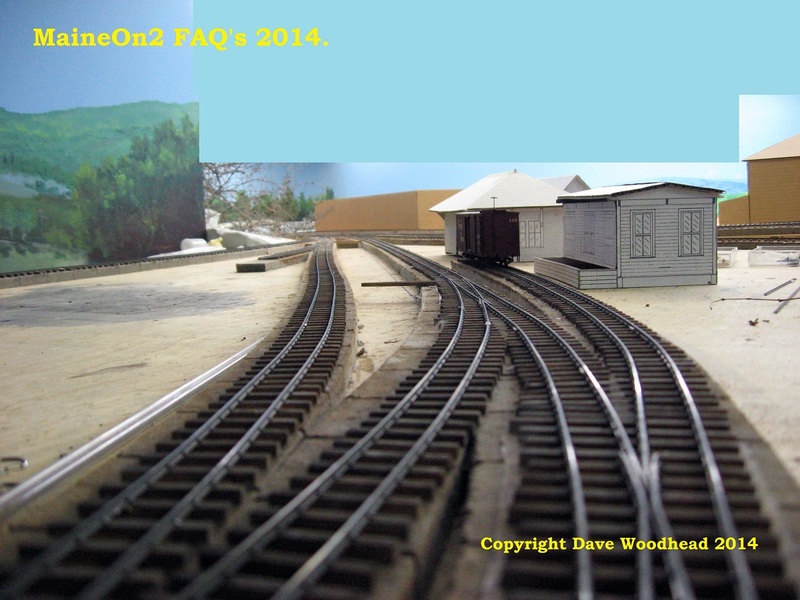 Great layout work, great photography, many thanks for sharing. Well done Gerry! Mistake now corrected.